Sidney Rice out for the season, what now? Sidney Rice is done for the year, but will he back next season? I have a lot of time for Rice. Statistically you can argue he wasn’t worth the 5-year $41m contract he signed two years ago. In reality, he might be worth every penny. A few weeks ago I went back and watched Seattle’s game at San Francisco from 2010. It was Pete Carroll’s first year in charge, and Mike Singletary’s last. It ended 40-21 to the 49ers. And the Seahawks were awful. Looking at the roster, it was no surprise. The 2010 ‘Hawks are a million miles away from the current edition. If you need a pick-me-up after Monday night, I’d recommend going back and looking at some of those 2010 games. It’ll make you feel better about the rapid progress this franchise has made under Carroll. Sidney Rice was part of the quick turnaround. A big part. There was no doubt they needed a kick start. An injection of talent. The kind of proven talent that only free agency can provide. Rice and Zach Miller were crucial additions. They immediately brought credibility to an offense that had previously relied on Deon Butler, Brandon Stokley and Ruvell Martin. They were statement additions. The league took notice. Seattle means business. And while they might never repay the financial investment via yardage and touchdowns, they certainly paved the way for the transition from rebuilding also-rans to genuine challengers. Even statistically you can make a case for saying Rice has been somewhat successful. The injuries clearly hampered his 2011 and 2013 seasons. Yet when he was relatively healthy in 2012, he led the team for receiving yards and touchdowns. 748 yards and seven scores might not compare to Calvin Johnson’s statistics, but Seattle aren’t the Detroit Lions. They were fielding a rookie quarterback. They ranked #27 in the NFL for passing yards per game and #32 for pass attempts. The Seahawks have never really used a traditional #1 target in the Carroll era. They’ve spread the ball around, whether it’s Matt Hasselbeck, Tarvaris Jackson or Russell Wilson under center. It’s a run first team, determined to feed Marshawn Lynch ahead of the receivers. This isn’t the environment for elite wide out production. Rice’s numbers last year, when you think about it, are pretty good. If this is his last season in Seattle, he should be remembered fondly as a competitive player who epitomised the blossoming attitude of this team. I’ll remember him as the guy who made several incredible sideline grabs to extend drives. I’ll remember that touchdown against New England — a signature play from last season. And I’ll remember the way the younger players looked up to him, saw him as one of the leaders of the group. He helped create what we see today. His cap hit in 2014 is $9.7m. The Seahawks can save $7.3m by cutting him. They’re going to need to make some cuts. It’s unavoidable. He wouldn’t be the only one. Richard Sherman and Earl Thomas are getting paid in the off-season. Michael Bennett should be paid too. I suspect they’d like to make a push to keep Golden Tate. Rice’s injury record makes him almost impossible to retain at $9.7m. Could they re-do his deal? Possibly. If he’s going to be cut anyway, he might be willing to restructure his contract to essentially make it a one-year chancer. 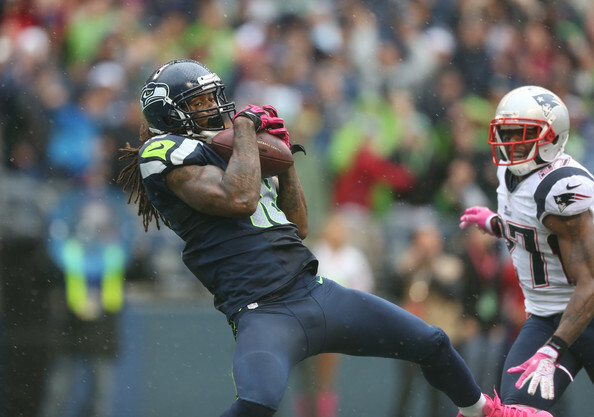 The Seahawks could easily back-load the new deals for Sherman and Thomas. That would allow them to keep Rice on a decent one-year contract. He would then be a free agent going into 2015, with the incentive of a big year in 2014 leading to a nice offer elsewhere. That could still be a challenge if they intend to keep Tate around (and/or Bennett). And let’s not forget they went big on Percy Harvin. If they intend to make Harvin the focal point of the passing game, it makes little sense to pay the supporting cast big bucks. That’s a debate for the future. Right now the Seahawks will miss Sidney Rice, especially with Harvin out indefinitely and seemingly still a few weeks away from contention. This team avoided injuries for virtually the entire 2012 season. This year, the injury-bug is back with a vengeance. If the Seahawks want to go receiver early this year, there are some options. Odell Beckham (WR, LSU) is a vastly underrated talent. His partner in crime Jarvis Landry likewise should be moving up boards. Mike Evans is having a big year at Texas A&M while Jordan Matthews continues to do his thing at Vanderbilt. There’s depth across the board. Two other players who started the year as potential top-15 picks could also be set for a fall. Marqise Lee has struggled with form and injury — the mess at USC has also contributed. He lacks prototypical size and could drop as a consequence. Sammy Watkins at Clemson has been called out by one of his coaches and remains a bit of an enigma. If he drops, you still have to consider him. The talent is too high. He is a true game changer and with the right guidance could blossom into an elite NFL receiver. It’s set to be a strong year for offensive tackles, but it’s not a bad year for receivers either. Seattle will have some options. Draft priority: Guard or Tackle? Do the Seahawks need to target an upgrade at guard? The question was posed in the comments section yesterday. I still maintain the biggest problem last night was scheme and injury. Leaving Paul McQuistan (a guard) and Michael Bowie (a 7th round rookie) on an island with two of the best pass rushers in the NFL was suicide. And it merely reminded everyone how important Russell Okung and Breno Giacomini are to this team. Put them back in the line-up and you see an instant, substantial improvement at tackle. You’d also see an improvement at guard. An offensive line will always be about the unit. A weak link has the ability to pull down the rest of the group. Two weak links makes life very difficult. J.R. Sweezy had two early penalties last night — one for holding, one for illegal use of hands to the face. Twitter immediately kicked off, calling for Sweezy to be benched and eventually replaced. Put yourself in his shoes for a moment. He’s a second year player. And not a second year NFL starter, I mean a second year offensive lineman period. He’s playing next to a guy that in all fairness shouldn’t be asked to block Robert Quinn or Chris Long 1v1. Surely in that situation you can understand why Sweezy was a little jittery? Perhaps he tried to do too much? And when your unit is being dominated in a way most of us have never seen an offensive line get dominated before — how does that not get into your head? This isn’t an excuse for Sweezy, Max Unger or James Carpenter last night. I just think it’s difficult to judge the interior linemen with McQuistan and Bowie at tackle. I don’t buy into the over analysis of the two guards this year. I feel like I’ve seen a lot of positive plays by Carpenter in the run game. He’s never going to be a terrific, mobile pass protector. But this is supposed to be a power running team. And I think a combination of Okung/Carpenter can prosper if they get anything like a run of games together. I’m unwilling to write off Sweezy, who likewise has made several key blocks in the running game and continues to learn on the run. Tom Cable isn’t crazy or even that unorthodox for putting a defensive player on the offensive line. Look at Florida State — the #3 team in college football right now — using a former defensive player to watch Jameis Winston’s blind side. This is the future. Nearly all the best college athletes are playing defense these days. You have to fight fire with fire. We’ll see more and more of this. Guys like Eric Fisher — touted as an athletic tackle — are struggling against NFL athletes. And he was the #1 overall pick. With Sweezy, put him alongside a veteran tackle and center and watch him grow. For chunks of this season he’s been the only starter on the offensive line playing in his intended position. How is that a solid learning situation for a young player? That’s not to say this team can’t improve at guard. You never rule anything out. If the right player is available in the draft next year, then you consider making that move. I’m yet to see a guard worth a first round grade for 2014. Gabe Jackson and Cyril Richardson are both in that 330-340lbs range and just remind me of Carpenter at his biggest. David Yankey is a technician but also has the look of a classic overrated Stanford lineman. Xavier Su’a-Filo at UCLA might be one to consider — he’s only a junior but if he declares he could go early. After that, I’ll take your suggestions. There’s no Jonathan Cooper or Chance Warmack here. No plug in and play solution. 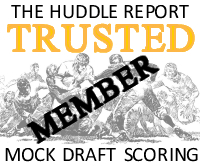 At tackle, however, there’s a long list of prospective first or second round players. The aforementioned Florida State tackle — Cameron Erving — is a very intriguing prospect who has all the athletic qualities to play guard or tackle in the modern NFL. He just needs polish and good coaching. Cedric Ogbuehi — if he declares — would be a fascinating option out of Texas A&M as a right tackle (see video above). I like Notre Dame’s Zach Martin more than most and he could play tackle or guard. Then you have all the usual suspects that we’ve talked about so much. Factor in that Breno Giacomini is a free agent next year and unless you intend to start Bowie again, you’re going to need to either pay Breno (difficult) or replace him in the draft. Supply meets demand at tackle. I’m not sure that’s the case at guard. And I’m intrigued enough by Alvin Bailey (clearly in a redshirt year this season) to think he could be a prospective starter at guard for the long haul and a versatile G/T option similar to McQuistan (also a free agent). So if we’re talking about the draft priority on the offensive line, I’m still siding with tackle over guard. And I still believe Seattle’s issues on the offensive line will ease greatly when their two starting tackles return (stating the obvious) and they discover the art of max protect. Instant reaction: Seahawks beat Rams. Somehow. This was the most unpleasant experience of my Seahawks fandom. Let me quantify that. Watching a hopeless or rebuilding team getting blown out isn’t unpleasant. For the most part it’s expected and not in the least bit surprising. This game made me want to take a shower. It made me pace around the room clutching a foam football. It made me agitated at a time when, as a new parent, I’m already getting a minimal amount of sleep. And worst of all it made me question what on earth they were thinking. I’m happy to win ugly. Who isn’t? That old cliche says the good teams frequently win ugly. But this was beyond ugly. It reminded me of the scene in Hostel with the eye. In fact, it was worse than that. Tonight it was a national embarrassment. Yes, the Rams have a sensational pass rushing duo and a not too shabby interior rush. Their front seven is one of the best in the league. Tonight though, they had it easy. I spent the entire game trying to work out what exactly Seattle was trying to do on offense. I mean, usually when you come up against a top pass rush you try to establish the run to slow it down, then use play action. This didn’t work against Houston, so I kind of figured why they weren’t doing that. Plus the eight man fronts made it difficult early on. The best way to spread out a loaded box is to go empty backfield. They tried that, but then had everyone running routes and left the two backup tackles 1v1 against Chris Long and Robert Quinn. That’s fine, if you’re going snap-throw to purposely designed quick-hitting routes. They never really got this going. They threw three screens in the game and all worked for positive yardage. Hey, you can’t keep milking the same cow but it’s the one thing that seemed to work all night and yet they never went back to it. They didn’t really try to move the pocket or utilise Russell Wilson’s scrambling ability. I don’t recall many bootlegs. It was just a head-scratching mess. Clearly the offensive line was over-stretched. Individuals will be criticised. And this isn’t my attempt to exonerate blame. Nobody played well on that line. However, this is a team that would’ve struggled against Quinn and Long with Russell Okung and Breno Giacomini starting. They had to be ready to help out the tackles by playing max-protect with backs and tight ends spending nearly the whole game as extra blockers. Paul McQuistan isn’t a left tackle. Michael Bowie is a seventh round rookie. Help them like you’ve never helped two tackles before. The coaching staff needs to take full responsibility (and I suspect they will). I’m guessing we’ll have a week now of people talking about how we need to draft for the offensive line. That’s fine. But if your new first round pick gets injured, or Okung goes down again, tonight can’t be repeated. This was all about a hopeless scheme and a badly prepared offense that did nothing to limit St. Louis’ greatest strength. This isn’t just on offensive coordinator Darrell Bevell either. Tom Cable and Pete Carroll need to shoulder an equal portion of blame. Take away an 80-yard touchdown (that arguably should’ve been picked) and you get 59 passing yards and 44 rushing yards on the night. It didn’t need to be this way. – For the first time, I really felt Wilson got jittery and started to worry about the protection issues. Who can blame him? He deserves no blame for that. The coaches and offensive line take full responsibility. If Wilson’s game suffers over the next few weeks as a consequence of bad pass protection, they’ll be to blame. – Drops. Too many tonight from the receivers. On a night when big plays were at a premium and all but two drives ended in a punt, the simple plays needed to be completed. Jermaine Kearse’s key third down drop late on was a killer. – The defense was on the field for 38 minutes and nine seconds. They looked shattered at the end and still made a brilliant goal line stand. The offense hung them out to dry tonight and they still won the game. – The ref’s were a joke for both teams. Let the guys play for crying out loud. The NFL needs to know this kind of display is hurting their product. – This is the first week the offense had no turnovers. There’s your positive. – Even despite the obvious schematic shambles, it’s unacceptable that Marshawn Lynch had just eight carries tonight. How did that happen? – As Golden Tate taunted his way into the end zone, all I could think of was Cordarrelle Patterson’s called-back touchdown for Tennessee last year. Thankfully, the NFL rules are different to college rules. I bet Golden Tate is grateful for that, too. A comprehensive win is required to wash away the memory of this game. Thankfully the 0-8 Buccs are in town next week. And yet this is without doubt the best start to a season in franchise history. And the Seahawks are still a really good 7-1 football team. What a weird sport this is. I’m going to write a bigger piece on the receiver class later, but I had to highlight yet another brilliant play from Odell Beckham today (in a surprisingly close game for LSU against Furman). You can see the play here. He’s not the biggest receiver, but you won’t find a better competitor. Every single week he makes a grab like this, in traffic. He ended the game with six catches for 204 yards and added this score late on. He did muff a punt in the game, which is a bit of a collectors item. Even so, in a year where Mike Evans, Sammy Watkins and Marqise Lee are getting most of the attention, Beckham deserves a lot more praise. He’s a NFL receiver playing in college. He started the year as one to watch. Now, he’s probably one to forget. Colt Lyerla was arrested on Wednesday for unlawful possession of cocaine and interfering with a police officer, according to the Lane County (Ore.) Sheriffs Department. The news follows his recent departure from the University of Oregon, after a troubled career that included much controversy. The report states police observed Lyerla snorting what appeared to be a white powdery substance in a parked vehicle in Eugene. He admitted to using cocaine. This probably ends his hopes of playing in the NFL. There’s simply too much baggage. How do you fix a problem created by injuries? Essentially, that’s the dilemma facing the Seahawks. There really is only one area of the roster that can be listed as a concern right now, and that’s pass protection. And it’s a very difficult problem to solve during the season. Losing Russell Okung for several weeks was bad enough — but having to replace 4/5th’s of your line aggravates matters even further. Granted things will get easier. Seattle has come up against some of the best pass rushing teams in the league — Carolina, San Francisco (with Aldon Smith), Houston and Indianapolis. There’s one more tough match-up next week against St. Louis and then a breather — Tampa Bay, Atlanta and Minnesota shouldn’t threaten even a make-shift line all that much. The imminent return of Breno Giacomini will be a big boost. Michael Bowie, for all the potential he’s shown as a rookie, had a nightmare against the Cardinals. You have to expect the odd game like that considering his lack of experience. Overall, however, I think there’s a perception that this is suddenly a big need — one that desperately needs to be addressed via the draft. That might not strictly be the case. But I can see it. For starters, there’s very little you can do about injuries. Look at all the big name stars that picked up season-enders on Sunday. It’s probably a good thing Seattle didn’t play yesterday. Last season the Seahawks managed to avoid any serious injuries until the playoffs — when they lost Chris Clemons. This year they haven’t been anywhere near as fortunate. It happens. And it’s to their credit that they’ve still managed to achieve a 6-1 record without Okung, Giacomini, Percy Harvin and most recently Bobby Wagner (among others). Seattle has stock invested in the future of the offensive line. Alvin Bailey showed a lot of promise in pre-season but has been MIA since. This might be a year too soon for Bailey, who took snaps mostly at left tackle during the summer despite playing guard at Arkansas. He looked fantastic at times. Considering who they’ve cut since (including multiple offensive linemen) this suggests they’re determined to keep working on Bailey perhaps with the idea of slotting him into a starting role for 2014. It’s likely a similar situation for Bowie, despite being propelled into the team this year. All right, the Arizona game was ugly. But there’s also been some high points too. Just not enough yet to displace Giacomini permanently. So the current issues with pass protection are possibly a little over-played. Not many teams can survive without their Pro-Bowl left tackle and center — let alone get to 6-1. At the same time, I suspect the Bailey and Bowie projects are at least partly down to the likelihood of Giacomini and McQuistan not being re-signed next year. It’ll be tough to keep either with Richard Sherman, Earl Thomas and probably Michael Bennett expecting to be paid. I doubt it’s a coincidence that both rookies have taken snaps at tackle and guard as they potentially look to replace the versatility of McQuistan. Bailey and Bowie might be considered quality, cheap depth rather than long term starters. So then it comes down to whether you let Tom Cable go after his guys late in the draft again, or whether you target this area much earlier (such as round one). I’m open to the idea of drafting another right tackle in the first round, despite the fact it’s something I’ve been vehemently opposed to in the past. I just think it’s a position that can be filled without top end investment. The right tackle generally protects the quarterbacks strong side and in a lot of formations they also get tight end or running back help. Seattle has managed to plug in Giacomini relatively simply and contrary to a lot of complaints last year, he more than held his own against many of the NFL’s top pass rushers. Yet the team is so stacked across the board and continues to find gems in the later rounds of the draft, UDFA or free agency. Even if they’re forced into a handful of high profile cuts in the off-season to save money, I think they’ve sufficiently planned and prepared for the future. For example, if they choose to cut Brandon Mebane and save around $5m on his contract next season, they already drafted Jordan Hill in round three the previous year. It’s no stretch to think Hill, despite a quiet and injury-hit rookie year so far, will be thrust into action in 2014 as a possible new starting one-technique. Likewise at receiver we’ve seen the continued development of Jermaine Kearse. Luke Willson might still play himself into a greater role, while Doug Baldwin has shown more than enough to justify greater attention in the passing game this year — let alone in 2014. If they cut Sidney Rice or lose Golden Tate, the addition of Percy Harvin gave Seattle a ready-made explosive target to pick up the slack. Just as we’ve seen with Bowie and Bailey on the offensive line, the Seahawks are one step ahead of the game. Across the board. So while I could easily see this team going WR, CB, DL or TE early in the draft, I could also see them going for that tackle who can come in and start right away. And as we’ve discussed many times already, the 2014 class will again feature a large number of offensive linemen going in the first round (see below for a list of names). If the Seahawks want to add an offensive lineman in round one next year, they should be able to. Even if there’s another early rush on the position (it probably won’t be three of the top four picks like 2013, considering the depth at quarterback and presence of Jadeveon Clowney). To go back to my initial question — how to fix this injury situation today — I’m not sure there’s much else that can be done right now. Wilson will have to keep avoiding pressure. The running game will be a little boom or bust at times. When Okung and Giacomini are both back in the line-up, however, this particular problem should ease. The NFC has quickly turned into a three-horse race for the #1 seed. Seattle and New Orleans have flirted with separation from the pack — and it’d be silly to count out San Francisco. Green Bay could still get involved, but…. meh. They rely too much on Aaron Rodgers, as great as he is. The three main contenders all face each other in the next few weeks, with New Orleans hosting the 49ers, San Francisco entertaining Seattle and the Seahawks getting a home game against the Saints. Apart from that, there’s not a lot to worry about. The Saints face divisional road games against the disappointing Falcons and the tough-but-not-great Panthers. Seattle also goes to Atlanta but has a favourable schedule apart from that. The 49ers go to Washington but that’s about it. Essentially this is going to be a battle to hold serve. All three teams will want it to come down to those games against each other, not lost opportunities beforehand. The news of Sam Bradford’s season-ending knee injury will surely thrust back-up Kellen Clemens into a starting role. It’s a shame Matt Flynn was already signed by the Bills — it would’ve been interesting to see Seattle vs Flynn on MNF next week. In either scenario, the Seahawks have to win. A potential banana-skin of a contest has suddenly become extremely favourable. The meeting with Tampa Bay at Century Link should take care of itself (well, it should…). The other two games before the double header against New Orleans and San Francisco? Atlanta (A) and Minnesota (H). Taking care of business is the name of the game right now. 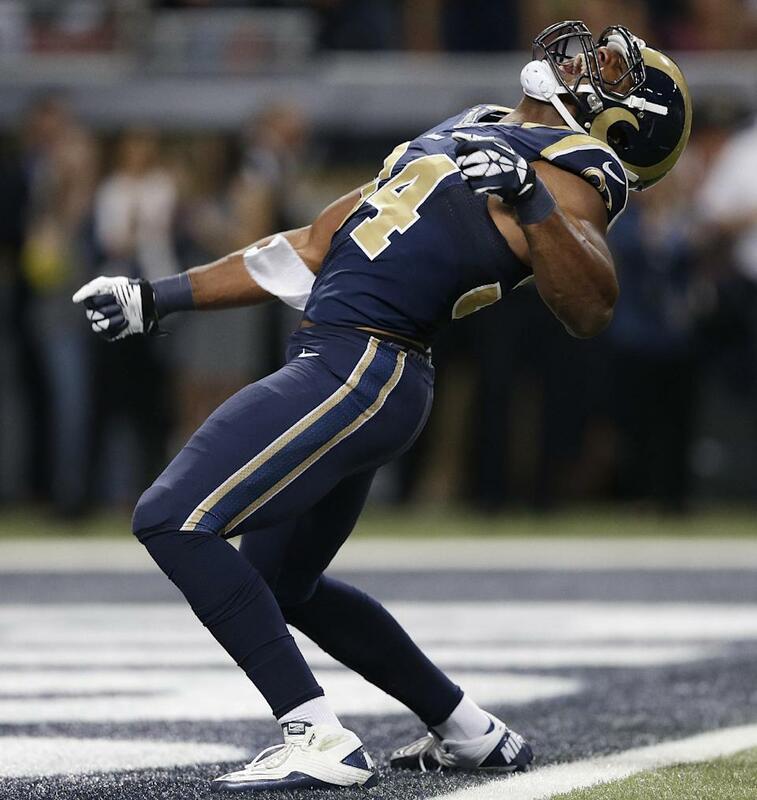 Even with a healthy Sam Bradford, the St. Louis Rams have been a major disappointment this year. They’ve had the fortune of spending three first round picks in the last two drafts and will get two more in 2014. They’ve also been fairly pro-active in free agency, while appointing one of the finest Head Coaches in the league. And yet they still look so mediocre. Seattle’s week one victory in Carolina was written off by some as a lucky escape at the time. Sunday’s comfortable victory for the Panthers over the Rams showed what a tough place it can be to get a victory. So far St. Louis’ three wins have come against Arizona, Jacksonville and an imploding Houston team. They’ve been easily handled in games against Atlanta, Dallas, San Francisco and Carolina. It doesn’t get any easier. After next weeks meeting with Seattle, they get the following — Tennessee (H), Indianapolis (A), Chicago (H), San Francisco (A), Arizona (A), New Orleans (H). With Kellen Clemens at quarterback, or one of the newbies they intend to try-out, will they win any of those games? If not, they could be staring at yet another top-ten pick and another season of misery. People will ask questions about whether they’ve gone in the right direction under Jeff Fisher. Really, they had no choice. Bradford’s contract, signed as a #1 overall pick in the old CBA, made him virtually immovable. When Fisher arrived in St. Louis, Bradford was just two-years into his career. That’s two years since he was almost universally considered the consensus #1 choice in a draft containing a decent amount of top-end talent. It’s easy to sit here now and say the Rams should’ve drafted Robert Griffin III in 2012 instead of trading his rights to Washington. And sure, in my opinion, St. Louis would be a much more competitive team with RGIII. Despite Bradford’s decent numbers this year, a lot of his best work was done in a garbage time defeat to Atlanta, a blow-out loss to Dallas, an easy win over the worst team in the NFL and a gift-wrapped victory over Houston. But the Rams simply couldn’t take Griffin III. Not really. They were stuck with Bradford and his contract even if they wanted to trade him. The dead money on his deal this year was worth over $23m. Who inherits his major contract when you know the new CBA contains a rookie salary cap? If they’d drafted RGIII and just kept Bradford, you’re talking about at least two seasons with the most expensive backup quarterback you’ll ever see. They did what they pretty much had to do. They accumulated enough picks to build around the incumbent starter. To give him the best chance to succeed. And that meant passing on RGIII. Sadly for Rams fans it hasn’t had the desired impact. Bradford still looks average at best. They drafted an explosive chess piece in Tavon Austin and inserted him into one of the most conservative offenses in the league. They lost Steven Jackson, and with him any semblance of a much needed power running game. The plan they took, the plan that passed on RGIII, made sense. They’ve just fumbled the ball since. Instead of making life easy for Bradford — they stymied him. They’ve hammered their own running game and brought in players that go against everything their offensive coordinator stands for (eg anything interesting or creative). As a consequence Bradford’s made very little progress. But he’s got an excuse. And that puts the Rams in a messy situation now. They could re-sign Bradford to an extension (despite his performance and ACL injury) with reports suggesting prior to his hopeless display against San Francisco that the team was keen to press on with talks and get a contract finalised. They could let him sit on the last two years of his deal, but they’d once again be snubbing what looks like a good group of quarterbacks in the 2014 draft. Or they could cut him and take the hit on $7m’s worth of dead money, draft a new quarterback (with two first round picks, they could theoretically target whoever they want as they have the ammunition to move up) and try to change the direction of the team. There are yet more big decisions coming for Seattle’s NFC West rival. Right now, like Arizona, they’re on the outside looking in. Redskins are trying to trade TE Fred Davis, per league source. So the Redskins are trying to deal tight end Fred Davis. I hope they don’t expect to get much in return. Davis’ work habits have often been criticised, while he’s also been hit with the injury bug too. At his best (not seen it for a couple of years) he has been an effective tight end. In 2011 he had 796 yards (his best season) while he also recorded twelve touchdowns between 2009-11. Seattle might have little interest in spending anything more than a throwaway conditional pick on a player who is a free agent in 2014. He might even get cut by the Redskins. But there is some USC history there with Pete Carroll. He’s earning $2.5m on his one year contract this year. It’ll probably come down to how they feel about Kellen Davis (who got his first Seahawks touchdown last Thursday) and whether Washington appreciates this isn’t a sellers market. Now that this story has leaked, they’ll struggle to get anything. Ebron’s stat line: eight catches, 199 yards and a touchdown.